The production involves three one-act plays, each focusing on issues plaguing veterans returning from combat: loss of connection to family and friends, post-traumatic stress syndrome, depression, and suicide. In “Daughter,” Alma tries to reckon with injuries suffered by her beautiful daughter, Monique, while serving in the U.S. military in Iraq — injuries so severe that she no longer has a face. “‘Daughter’ is a deep, uncompromising play about faith,’” said David Gordon, theater critic for nytheatre.com. In “Son,” on the occasion of his sister’s wedding, Craig struggles with haunting flashbacks to the war and the bomb he dropped on a wedding party. Collaborating with Medley in the writing of “The War Within” were production director and DOTD associate professor Kathryn Bentley, and the cast. The play speaks to issues regarding veterans re-entering civilian life. General admission is $15. The cost is $12 for SIUE alumni, faculty, staff, seniors and non-SIUE students; and free for SIUE students with a valid ID. Tickets are available by calling the box office at 618-650-2774 or visiting the Theater and Dance Box Office from 10 a.m.-4:30 p.m. Monday-Friday in Dunham Hall. Tickets may also be purchased before a performance at the Metcalf Theater Box Office. For more information, please call 618-650-2774 or send a message at theater-tickets@siue.edu. For directions and parking, please visit the SIUE website at siue.edu\maps. SIUE’s Department of Theater and Dance presents four plays and one dance concert during its October through April season. All productions are open to the public. The Department of Theater and Dance is part of the College of Arts and Sciences. 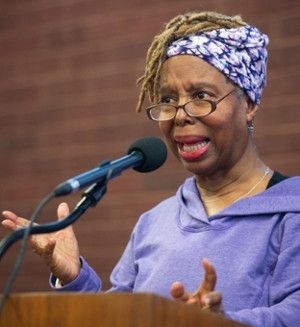 Cassandra Medley, New York playwright, will have her work, “Voices from the Front – Daughter, Son, and the War Within,” presented April 9-13 at The Metcalf Theater. 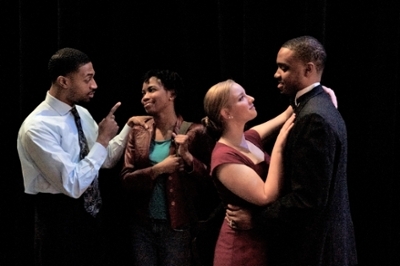 L-R: College of Arts and Sciences students Matthew Anderson, senior, Kiara Ulmer, junior, Sadie Harvey, freshman, and Justin Truman, senior, perform in a scene from one of Medley’s one-act plays.